Florence is the largest city we visited on this trip. It is a wonderful city of museums and sites. 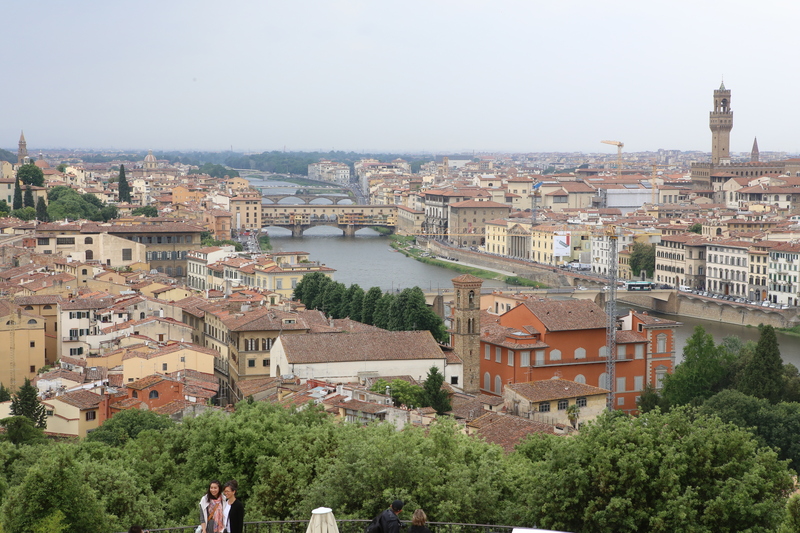 This is home to David, the duomo, the Uffizi Gallery and the Ponte Vecchio (old bridge). We will discuss Florence over the next few days. Today we will talk about the Duomo, Ponte Vecchio and the Piazzale Michelangiolo. Our trip in was by car. Florence is a big city with a lot of small streets. The center has restricted driving but you can drive in if you have a hotel reservation. We found a garage around the corner from our hotel and we had only two small streets to take to get there. Our first view was when we crossed the Ponte Santa Trinita (bridge). 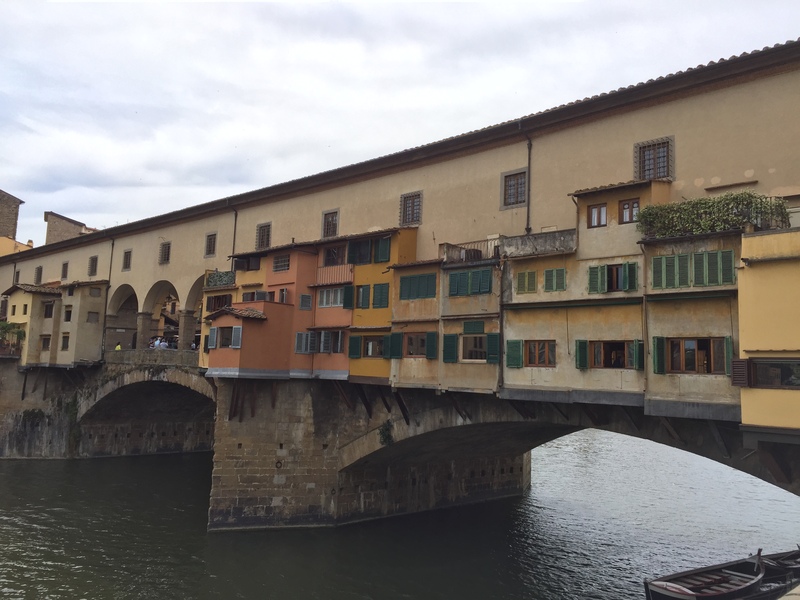 We looked down the river and saw the old bridge, the Ponte Vecchio. 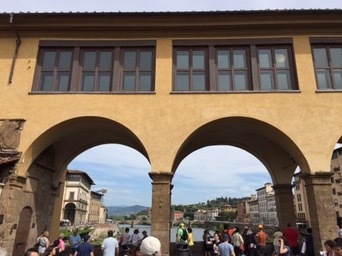 This old bridge used to sell meats and food but the rulers, the Medici, didn’t like the smell so they banned all sales on the bridge except gold. To this day it is full of gold jewelry shops. This is a fun bridge to walk across. If you notice the top of the bridge, there is a passage way. You can go in this by appointment only. It was used by the Medici to cross from their palace (Pitta) to the Uffizi where they worked and ruled. There is a gelato store at the other side of Ponte Vecchio if you are there on a hot day. 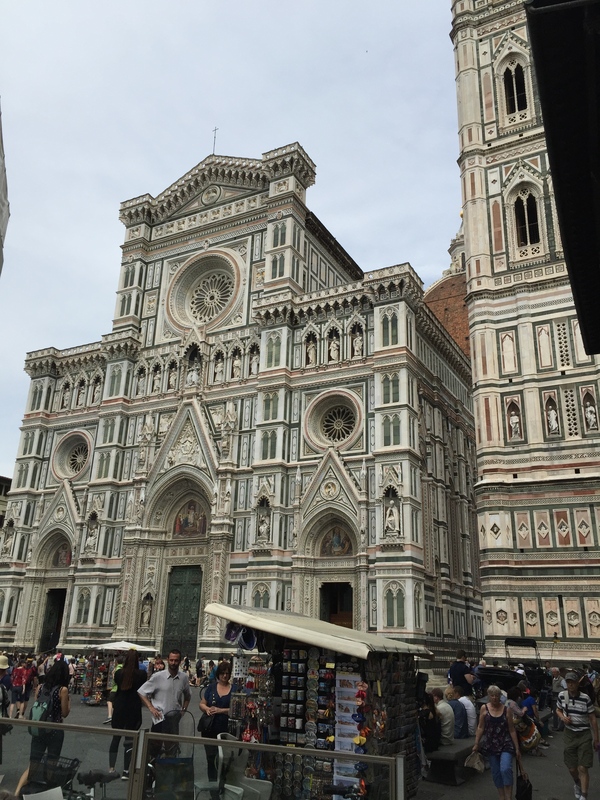 The Duomo is impressive on the outside. 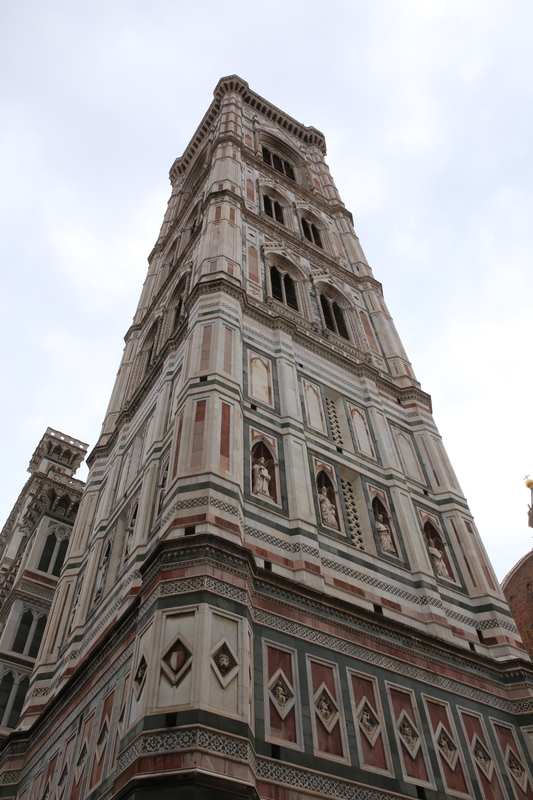 The inside is not as impressive as the duomo in Siena. The baptistery is separate from the church because an unbaptized person couldn’t enter the church. The doors tell a bible story in gold. These are a replica since being outside would eventually ruin them. The originals are in the Opera del Duomo museum nearby. 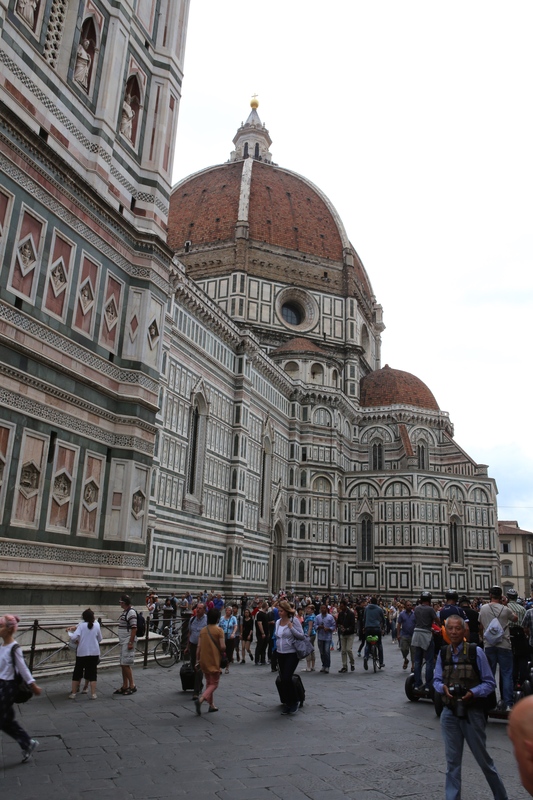 Lines can be very long at the Duomo and Baptistery. Go early or later in day. The piazza that includes the duomo is impressive. Stroll around it and be amazed that we humans could build such a structure in marble. The last thing to discuss today is the Piazzale Michelangiolo. This is a small area high on a hill across the Arno River. From here you can see fantastic vistas of all of Florence. You can go by bus, taxi or walk. We walked and there are a lot of stairs but the vista was worth it. You cross the bridge, Ponte all Grazie (one down from Ponte Vecchio) and follow the signs to the Piazzale Michelangiolo. Soon you will be on a long set of stairs. 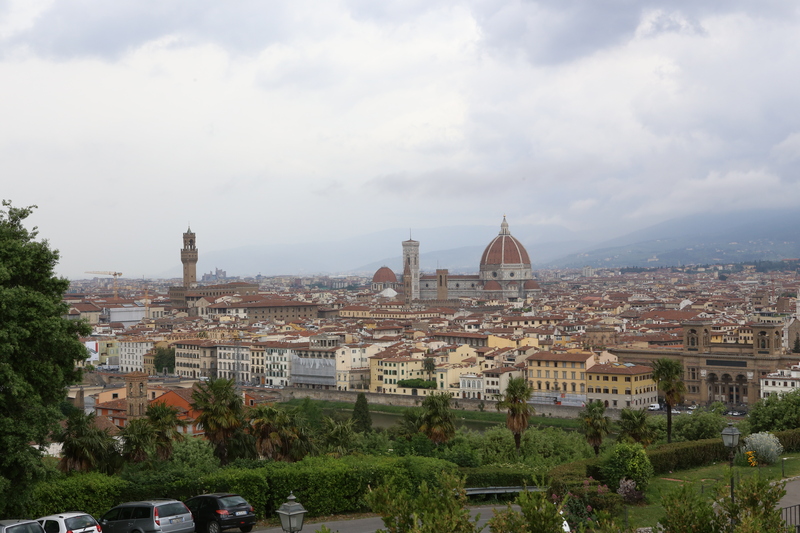 At the top is a tourist trap and the most beautiful views of Florence. Do not miss this! Tomorrow we will continue our tour of Florence. I always feel very comfortable in Florence. It is a very special City. I have had some great times there.